May not look right in Netscape and AOL Browsers. Press F11 for a better view. Some nearby places - Delhi , Roorkee , Mussoorie and Nainital. This is Delhi's Connaught Place . Named after HRH ( His Royal Highness) the Duke of Connaught , who was also resident at Meerut during 1883-84. 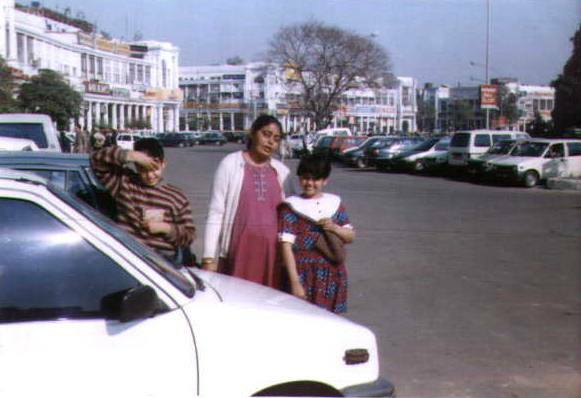 In Meerut Delhi's prosperity is largely attributed to it being the embezzlement capital of India. Only a handful of large industries exist around it. Tax is soaked up from the entire country and trickles down mainly here ( often for a consideration), benefits rarely reaching the sources. All Metro cities are characterised by a large English speaking population. In fact you will also find Indians who speak Hindi in the way the British( over 50 years ago ) did . Recent news called Mumbai a poor cousin of Delhi. Now look up the figures and see which city pays the most tax - Mumbai. It is known that 90% tax gets 'diverted' from its original target. Delhi's rise in prosperity has coincided with an increase in corruption since the mid 70s. The decision to build Connaught Place and the Parliament Complex (New Delhi) was announced at the The Great Coronation Durbar of December 12th 1911.. Sir Sobha Singh ( Writer Khushwant Singh's Father) was a main Contractor. Note : This is not a recent picture(1991). Now you can never see a clear section of a road. They are all plastered with cars. Sadly the best book I have about Delhi is The City of Djinns by William Dalrymple. Why Sad? Because it is not written by an Indian. William is a Scot, same as a lot of people who established and wielded the Raj. 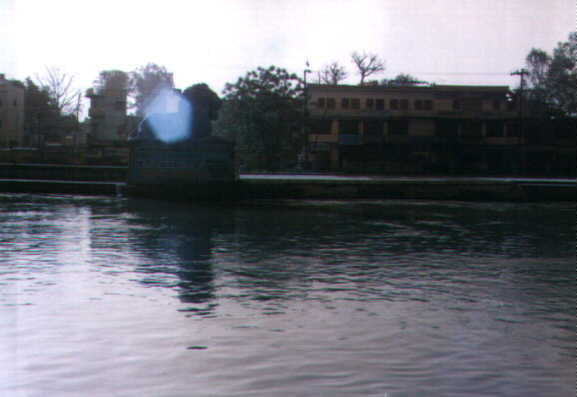 Roorkee . 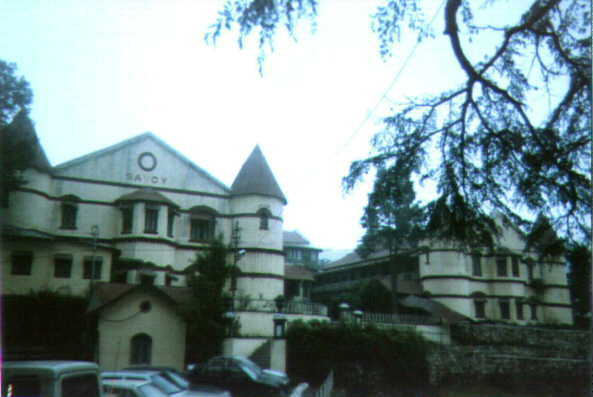 Has a famous and also the 1st Engineering College of India .This was the main Engineering College up to Independence. The very first Railway tracks were tried out here first. Somewhere close by you can see the canal flow over a river . About 120 Km ( 80 miles ) from Meerut. I understand the Lions are patterned after the ones at Trafalgar square( England ) , or vice versa. Hardwar and Rishikesh en route to Badrinath, are close by. These places are all of enormous religious significance for the entire country. And one sees number plates of distant states like Gujarat, West Bengal on parked busses. Some websites you must see. For rafting and rock climbing About 70km from Mussoorie. Tired of Slick 5 star places? Looking for a different view of India? Then Stay in some not well known places. Just want to go for a good long drive? It is now a very, very good road to Mawana. And of course The Cheetal Grand is about 50km away. And if all is not well you could even head for Delhi, 62km to the South East. This is Mussoorie . About 6-7 hours easy driving from here. 5 Hours in the morning . The traffic is getting worse every day. Start early. It is a different world . 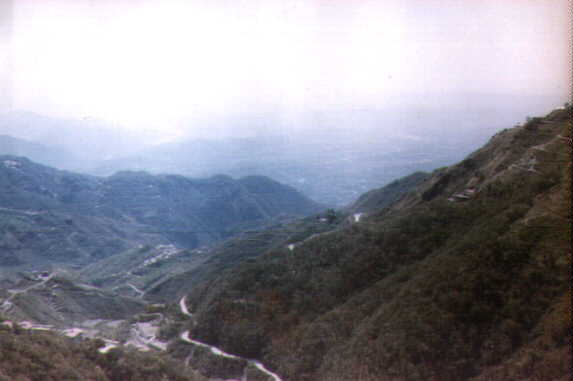 That down in the plains is Dehradun. Want to getaway from the heat in summer ? Or see the snow in winter ? You can get an Indica at around Rs. 5/= or less per Km near the Shahid Minar. Better still get a Toyota Qualis ( Rs. 6/= per km) for a very stress free noiseless ride from Krishna travels near Begumpul fruit market. . Place to stay in Mussoorie? Brentwood is great, near the Picture Palace end of the Mussoorie Mall Tel: 0135-632126,622102. Rs. 1850 per day for a suite with 2 bedrooms and a room with TV. 40% off in Winter. Charlene next to it (632808,632884), lower rates. Most of Mussoorie is hotels or restaurants, but check for accomodation before going. All the video game parlours are nearby. Surely Kulri must have the highest density of video game parlours in India. Mad about the Himalya then .. Click here to visit this very exhaustive site. The Savoy - nobody seems to know that it exists now . This was the pride of Mussoorie perhaps upto the 70s - 80s ( please confirm ), with beauty contests , jam sessions, training programs , official dinners , discussion sessions for the IAS trainees at Charleville etc. Now it is a pale shadow of its former self and does not compare with the slickness of the newer ones . The old rich and famous still come here. You cannot see them but there are 2 Mercedes standing in the foreground. Note the single room behind the cars. This is what remains of what must have been the only petrol pump then in Mussoorie ( yes, inside the hotel ). The newer hotels are good, but don't compare with the hotels of the famous chains run by the Tatas, Welcom group and Oberois. In all of UP possibly there is only one hotel run by one of these groups, the Mughal Sheraton run by Welcom group at Agra. The intractable state government machinery is said to be the reason for this. Otherwise surely Mussoorie and Nainital would have had a unit each from these big corporates. Now these have become part of a separate and smaller state( Uttaranchal), things are expected to speed up because of that. 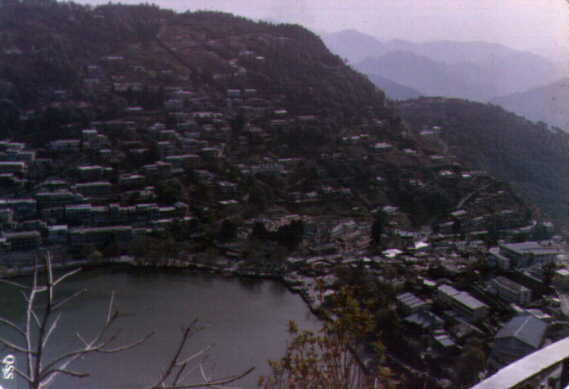 Nainital . About 7 hours drive if the roads are OK. 6 if you drive fast . Has a huge lake with boating . There are sailing boats too. A walk around the lake is a great pastime . There are Tibetan shops with all kinds of things which are not easily available in the plains. Books , articles , documents linked on this site : Macaulay's speech regarding a fund meant for upgrading India. , Macaulay's Complete text on Clive - very readable. You can even download a PDF file and print it. , A letter (2003) from a cantonment official to a resident of the cantonment quoting a 19th century East India Company document - the Old grant , Some idea of the state of Britian in Early 19th and late 18th Centuries , A viewpoint about the Mutiny - Ashok Nath , Extract from the Gazette of Meerut of 1903 , British trade at the peak of colonialism - Jeremy Seabrook , Imperialism begins at home - Jeremy Seabrook , Extracts from Macaulays text on Clive with reference to the Mahrattas , Inscriptions on the Mutiny memorial on the ridge at Delhi , Text of the Old Grant also CGO 179 ( CGO=Council General Order) , Rambles & recollections of an Indian Offical ( 1836 text - W. M. Sleeman) , The fall of the Mughal Empire in India , The Coronation Durbar of 1911- the Last , Site about a feature film by Charles Urban covering the 1911 Durbar , Of lavish Durbars and famines , About East India Company and Victoria's Empire , For those curious about Royalty , Delhi Railway museum leaflet , Sir Saiyyad Ahmed Khan's speech at the Nauchandi fair on March 14th , 1888 , An account of the attack on Vellore in Gillesspie's own words , A description and comparison of guns / muskets about 20 years before the mutiny , About the British East India Company( almost all European nations had East India companies) , About the Company rule and money collection methods in India , the main reason for their affluence and glory , Another well informed discussion on 1857 - Part 1. ,Part 2.